A study in tomorrow's Science1 finds a strong correlation between warming ocean water near New England, and declining harvests of Atlantic cod. The rapid drop in catches in the Gulf began in the early 1980s. Since then, cod-fishing quotas were slashed to allow cod -- and the cod-fishing industry -- to recover. 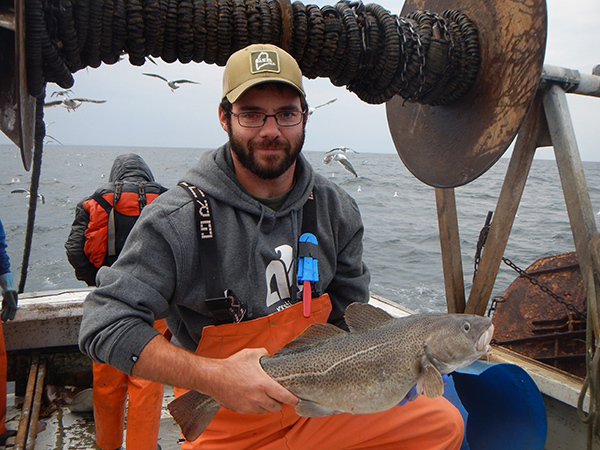 Zach Whitener, research associate at the Gulf of Maine Research Institute, holds an Atlantic cod, a once prolific but declining fish that supported a major fishing industry in the North Atlantic. Mouse over for a photo of cod drying for export in Burgeo, Newfoundland in 1908. Historic abundances of Atlantic cod off North America's East Coast played a key role in the development of coastal cities in New England and Canada. Cape Cod, forming the southwest border of the Gulf of Maine, was named for this abundant fish. The average surface temperature in the Gulf of Maine rose about 1°C in three decades, faster than 99.9 percent of the world’s oceans. A new study suggests that this warming explains much of the decline in codfish. The new study places the blame on rapid warming in the Gulf of Maine, where the sea surface temperature was rising an average of 0.03 ° C annually between 1992 and 2013. That's three times faster than the global average. "Correlation is not causation," as the maxim says. So how strong is the connection between warming water and cod decline? Fishing effort, a key factor in cod abundance, has been dramatically reduced as regulators -- over industry opposition -- have tightened limits on harvests and fishing time. 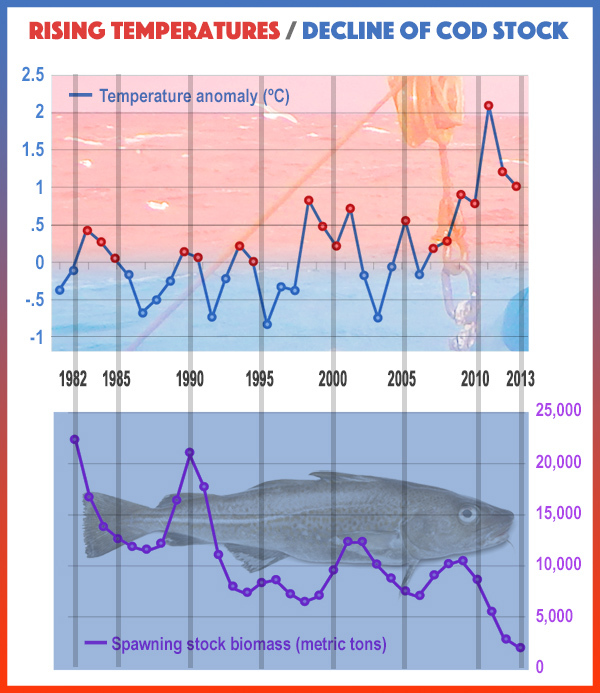 How might a 1°C warming harm cod? One link may occur during "recruitment," when new individuals enter a population. "For many years, we have been seeing poor numbers of young fish in surveys," says study contributor Lisa Kerr, a fish biologist at the Gulf of Maine Research Institute in Portland, Me. The transition from larva to juvenile fish is highly sensitive, she says, "so it's not uncommon to see a relationship" to environmental factors. The warming water could, for example, influence the number, activity and behavior of predators or prey. "A lot of what we describe is most likely hypothetical; its hard to say we know the exact mechanism," Kerr concedes. Since it's impossible to experimentally change conditions in the ocean, computer models are used to evaluate the effects of variables like fishing and water temperature support the link between warming and declining cod. The Gulf of Maine, which extends from Cape Cod, Mass., in the south to Nova Scotia in the north, is a large, nutrient-rich basin fed by cool ocean currents from the Labrador Sea to the north. 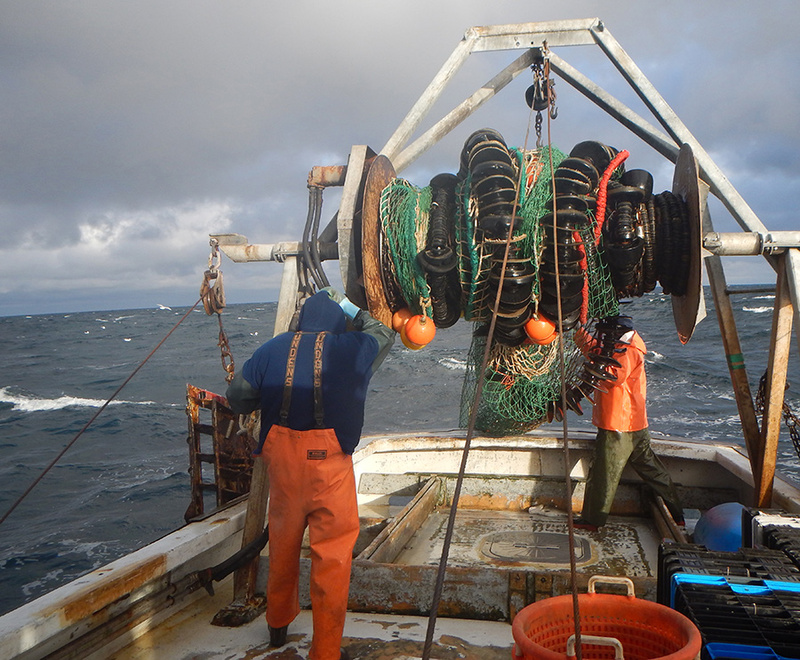 Cold waters, extreme tides and diverse habitat support several large fisheries, including haddock, herring and lobster, and, once upon a time, cod. Fishing in the Gulf of Maine is a tough, dangerous business. With declining catches, fishing supports fewer families and communities. If global warming accounts for the failure of cod to recover in the Gulf of Maine, what should we do? Since fishing boats "have done a very good job of staying within the quotas," Kerr says, it may help to adopt the "ecosystem approach to fisheries management," which inserts environment factors to management decisions. Although that approach is supposedly common, a 2015 study2 found that only 2 percent of global fish stock regulations are accounting for what's called "ecosystem drivers." At present, the cod industry in New England and Eastern Canada is watching as boats rust in harbors and the owners and crews look for work in places with few alternatives. Will the industry ever return to the sea and produce a meaningful catch? A lot depends on climate change, Kerr says. "One of our biggest recommendations is that we need to revise our expectations for cod productivity. Current expectations are based on history, but the capacity may not be there to reach past abundances because we are moving into a warmer climate." "It's heartbreaking to see what this has done to the industry in our region," Kerr says, "how many boats are tied to the docks, facing really hard times because of this shift in climate, and we have no control over that."